Still recording music on their own terms and not bowing to record label pressure to adopt a more mainstream approach – that particular compromise was still 5 years away – Metallica’s third album remains an intense, passionate and progressive high-water mark in thrash history. The track listing speaks for itself. “Battery” does exactly that, it batters you senseless, while “Master Of Puppets is a stone-cold-crazy classic and requires no further evaluation. “The Thing That Should Not Be” still hits like a brick to the gonads and conjures imagery of leviathan-esque, Lovecraftian monsters hell-bent on destruction; a rival to “For Whom The Bell Tolls” in imagery, atmosphere and execution. The remainder of the album is no slouch either, the band crafting a record that has rightfully gone down in history as a true metal classic, regardless of sub-genre. So, why not higher, you may ask? There’s no denying this is one of the greatest records in heavy metal history but it actually plays it safe in many aspects. 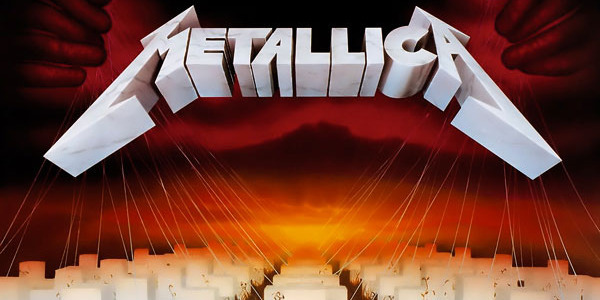 By following their Ride The Lightning formula to the letter, (hell-for-leather thrasher followed by epic title track, followed by atmospheric, slow-burner etc), Metallica diluted Master Of Puppets impact with over familiarity and quasi-sequel status. That’s not to say this album isn’t anything less than an absolute triumph, but a little bravery with dynamics and song order could have elevated it even further. With that in mind, the album nestled at Number 3 may not be too surprising….